This little hedgehog mushroom (a relative of the larger and better known h. repandum) is probably the most desirable species I have found thus far in my adventures. It is relatively small(~1 inch across the cap) and grows very close to the ground. It is suspected to be pretty closely related to the chanterelle (oooohhh) and is delicious! I have only found one small area where they are growing, however as they are supposed to be a perennially recurring species, I look forward to seeing them again next year with any luck! Hedgehogs are considered one of the "safest" wild mushrooms to eat, as their spore bearing surface (underside of the cap) is quite unique. Instead of gills on the underside (most common) or pores, the underside of these guys is covered in little teeth that look like mini icicles. All told I probably only collected about 15 of them- just enough for a tasty appetizer when sautéed in butter! 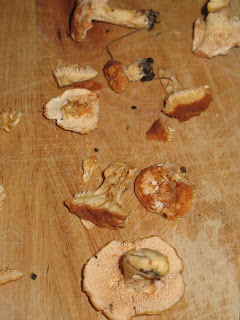 Read more about the Hydnum umbilicatum here or here. Flavor- Sweet and rich with a crunchy bite.